Named for its donor, the Huth Psalter reveals its origin by listing in its calendar of feasts and litany Saints Hugh, Wilfrid, and John of Beverly?all associated with Lincoln or York. Medieval psalters could be used publicly in the liturgy or privately as a prayer book, with decoration, calendar and added prayers tailored for the use of an individual or community. Unusual features of its illumination unusual features give vivid impressions of contemporary concerns and devotional practices. 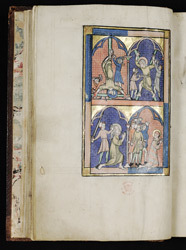 A two-page sequel of martyrdoms, beginning with the earliest saints, follows the Crucifixion picture. The apostles Peter and Andrew suffer variant crucifixions, their suffering emphasized by conspicuous hammers and nails plus the caricatured executioners? demented faces. Blindfolded St Paul prays calmly although his executioner grasps him brutally, raising an enormous sword. The first Christian martyr, Stephen, with blood streaming from his head, glances backward at those stoning him as he prays for them. The scenes represent to the believer models of Christian holiness, powerful miracle-working intercessors and visual statements of anti-Semitism.